It has been several months since the new generation of the BMW saloon, the BMW 5 Series, was officially launched. 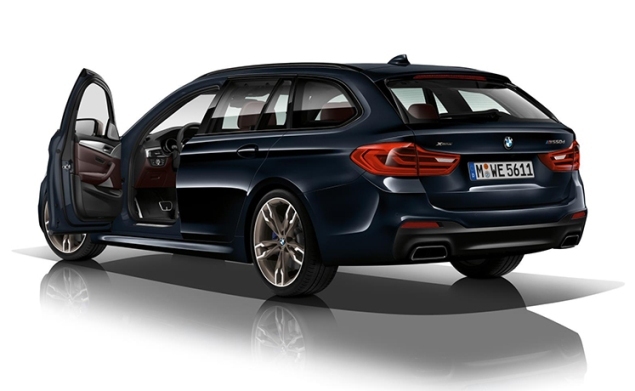 There is no doubt that the BMW 5 Series can be categorized as a Series 7 to scale, as it comes loaded with technology more own hatch of representation and, in addition, the design is also very similar between both models. Just do not think that being almost a saloon representation cannot be a fun car. We are waiting for the German brand officially to show the new BMW M5, the sportiest version of all. However, to calm the hunger, we can enjoy with the variant BMW M550d xDrive. Yes, this “d” after the “M550” means that dealing with a diesel mechanic, but first let us sees its dynamic performance and then judge. Its characteristics are: six cylinders in line, 3,000 cc, four turbochargers, 400 hp and 760 Nm. The BMW M550d Xdrive incorporates the most powerful inline six-cylinder diesel engine ever used on a production vehicle. The well-known 3-liter diesel block from BMW receives a large flow of air by forced intake thanks to these “four lungs”. The 400 hp is delivered at 4,400 rpm, while the brutal torque of 760 Nm is available at just 2,000 rpm. This, combined with the xDrive all-wheel drive system and the 8-speed Steptronic automatic gearbox allow you to make 0 to 100 km/h in 4.4 seconds and reach a limited top speed of 250 km/h. It is also available in the family touring body, in which the performances are very slightly reduced (0 to 100 in 4.6 seconds). Meanwhile, the approved fuel consumption is between 5.4 and 6.6 l/100 km. If you want a very fast sedan but usable in day to day, maybe this is your car. As standard, the most powerful Series 5 in the diesel range incorporates M Sport suspension lowered in 10 mm, integral active steering and oversized brakes with calipers finished in metallic blue. The sportiness of this BMW M550d xDrive is also reflected at a visual level. On the exterior, it has M aerodynamic package, elements such as rearview mirror housings or some details of the bumpers in Cerium Gray and alloy wheels with 19-inch M design worn by 245/40 front tires and 275/35 rear tires. Inside we will receive the M sports seats (as an option) with Dakota leather or Alcantara fabric, in addition to the M sports steering wheel.